Why do I need a Soil Contamination Report/Hazardous Materials Investigation/Acid Sulfate Soil Investigation? An environmental investigation is generally necessary at sites where redevelopment is about to take place. Often the need to conduct an environmental investigation is triggered by a Local Council, where information is available to suggest that contamination may be present. A Soil Contamination Report may be necessary where the Local Council is aware that fill soil was imported into the area at the time the land was originally developed. Often the records were non existent or not accurate, and so Council needs to be sure that in the course of redeveloping the land, no-one is exposed to harmful contaminants. A Hazardous Materials Survey is a Workcover / Government requirement that serves to identify and manage substances that could be potentially harmful to humans and the surrounding environment. An Acid Sulfate Soil Investigation may be necessary to protect the building / infrastructure against acidic leachates (corrosion) and to protect nearby waterways against acidic leachates which could have fatal consequences for local fauna (e.g. fish kills). 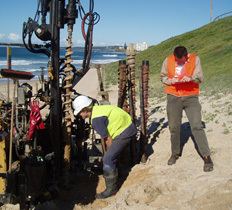 These are only a few examples of the types of investigations carried out by HEC Pty Ltd. Others include: Remedial Action Plans (RAPs), management of site remediation and validation projects, VENM validations, soil and water quality monitoring and general consultancy on chemistry and ecotoxicology. Please contact us for any further enquiries on our services. Why are contaminated sites a risk to the environment? Contamination in soil can be taken up by plants that are consumed by humans, livestock or other animals. Identifies what the potential contaminants are, and areas that they were stored and used, disposed of etc. Identifies and outlines the need for further work, if necessary (a multi-staged approach is usually the most practical way to investigate a site). How much does it cost to get my land investigated? The type of report required. The size of the land. Intended use for the redevelopment. Whether the redevelopment includes excavation of site soils, and how much of the soil will be removed. My neighbour had one of these soil contamination report done a few years ago. Why can’t I use that report? Reports are site specific, which means that they are tailor-made and restricted to the site identified in each investigation. Differences in land use, buildings / infrastructure, site history and even location will affect the recommendations and conclusions in each report. So results that are valid for one site may not be appropriate for another.